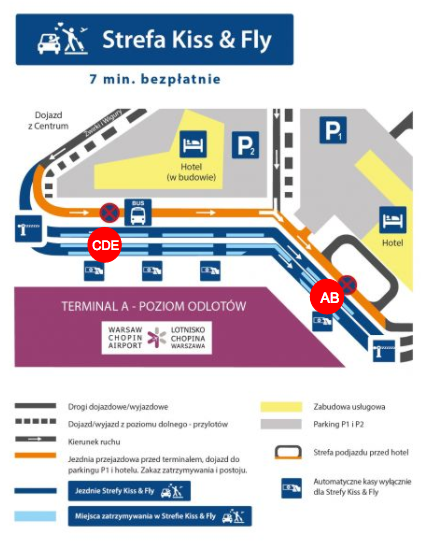 Starting on the 2nd of January a Kiss&Fly area has been introduced in front of the departure area at Warsaw’s Chopin Airport. The duration for which a driver can stop in this area has been limited – after 7 minutes, each private driver will be charged a fee of 30 PLN when leaving the area. As the first 7 minutes are free of charge, uber partner-drivers will wait a maximum of 3 minutes (counted since time of arrival to pickup point) before departing the designated area. After this time, the driver will have the right to leave the area and cancel the trip, which will result in a 10 PLN cancellation fee charged to the rider’s account. How can I ensure a swift pickup? If you did not manage to meet your driver in time, cancel your trip and request once more. #DoceniamyKierowców – zrób to razem z nami! Używamy plików cookie, aby zapewnić użytkownikom spersonalizowany i bezpieczny dostęp do naszych usług. Więcej informacji znajdziesz w Informacjach o plikach cookie.